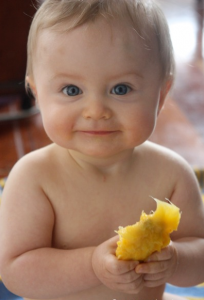 Home » Blog » Child Care » 5 must-have fruits on your baby’s Summer diet! 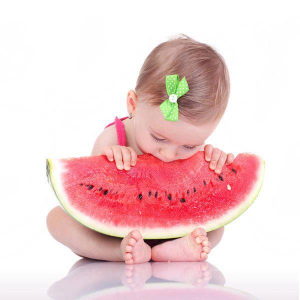 5 must-have fruits on your baby’s Summer diet! Summer-time calls for fresh & cool food time! Don’t you feel like having something fresh, cool & light for your meal? Eating something hot, is a big no-no for us, this summer. Then what about your tiny toddler? Ever wondered what’s good for him? Here are 5 fresh & nutritious summer foods to re-energize your baby & keep him fresh all day long! On top of the list is our super-cool fruit! Watermelons act as a cooling addition to your tiny tot’s drink diet. Having the highest content of water than any other fruit, it is a must-have for the hot summer days as it keeps your baby hydrated all day! Yet another delicious nutrition rich fruit!. The beta-carotene present in this fruit is converted into vitamin A when consumed which in turn helps strengthen the immune system. What else does it have? It is also rich in antioxidants, vitamin C, riboflavin, potassium & fibre – great for relieving constipation. 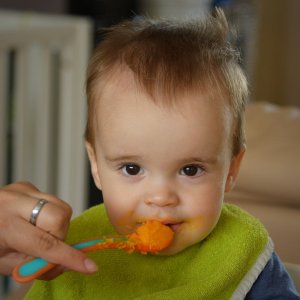 The long and short of it means that a ‘Peach puree’ is a must have for your baby. This delicious and enticing fruit is a nutritional powerhouse for your ever active naughty toddler. They contain an important antioxidant called lycopene, which helps in flushing toxins from the system. It is a natural sugar source, containing vitamins A, B, C, E & K, calcium, iron & what not. 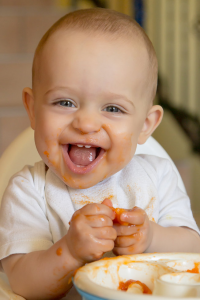 Is this not enough a reason to add apricot puree to your baby’s yogurt? Here comes the ‘King of Fruits’, our personal favourite too. This yummylicious fruit is easily digestible and is rich in vitamins, minerals and carbohydrates that’s good for the eyesight. Fights microbial infections, strengthens immunity, helps in brain development and protects against sunstroke. All excited to give your tiny tot a breathe of delicious mango smoothie or puree? 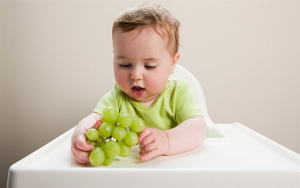 One of the very popular fruits in the world, grapes can be an awesome add-on to your baby’s diet list. Why? Well, it has a good supply of antioxidants, protects the central nervous system, acts as a natural laxative, is easily digestible and also stimulates the liver. Need we say more? Serve your baby some mashed up grapes and admire that ‘toothy’ smile as they enjoy it! These were some of the fresh, juicy and delicious fruits which can help cool down your cranky baby in summer. ⟵How to take the best care of your baby in Summer!